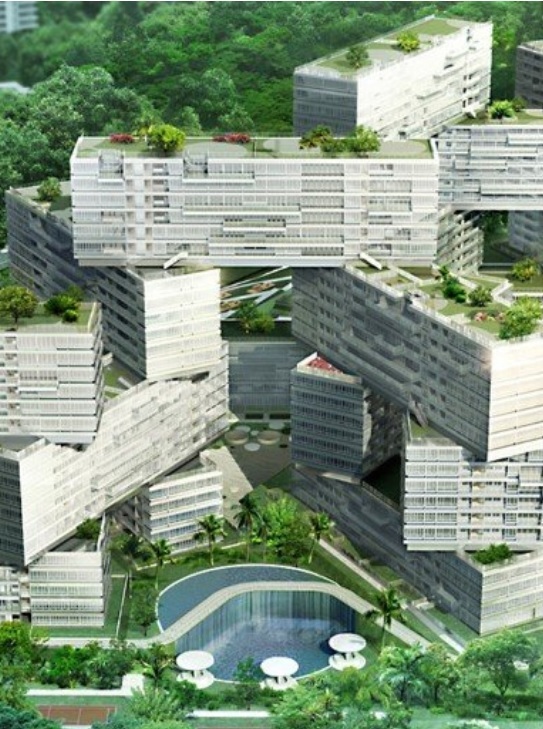 The Interlace, a futuristic condo with timeless appeal and 8 hectares of land to explore its themes and naturescapes. The Interlace located on the former Gillman Heights' HUDC site is CapitaLand's and Hotel Properties' gift to the people. A total of 1,040 apartment units sit on an expansive eight-hectare site. The Interlace is designed to challenge conventional, architectural norms. By creating a network of interconnected communal spaces interacting with its natural environment, it is at once novel and iconic. It has won over the hearts of many and is prominently featured by the media as a signature development with iconic status and star architect power. Twenty three apartment blocks, six stories tall each, are stacked hexagonally to form eight large-scale courtyards. The interlocking blocks resemble a ‘vertical village’ with cascading sky gardens and both private and public roof terraces. The Interlace actually incorporates sustainability features through careful environmental analysis of sun, wind, and micro-climate conditions on site and the integration of low-impact, passive energy strategies. The Interlace directly addresses concerns of shared space and social needs in contemporary context, through its multiplicity of indoor and outdoor spaces, specific to our tropical needs. Additionally, it is also focused on creating comfortable internal spaces with a vision to build homes that will last through the generations. In fact, The Interlace has succeeded to reinforce the interconnectivity between man and space, and the community and its natural environment. Set against the backdrop of the Southern Ridges, but yet in close proximity to the Central Business District, The Interlace offers its residents the best of both worlds. With its easy accessibility to retail, entertainment and office facilities, it is not difficult to visualize The Interlace strategic appeal, particularly to discerning, well traveled and cosmopolitan home buyers who have been searching for a home with a difference. CapitaLand Designer Series (CDS) offer signature-designed homes that embrace style, freedom and exceptional value. Tasteful and timeless, these bespoke residences offer a great many interior furnishings and options to cater to families and professionals around their lifestyle and tastes. Ready For Today's Contemporary Lifestyle. CDS homes - for a very limited period. Water park, Lotus pond, Spa valley, Play hills and the likes help take the stress out of a hard day's labour. 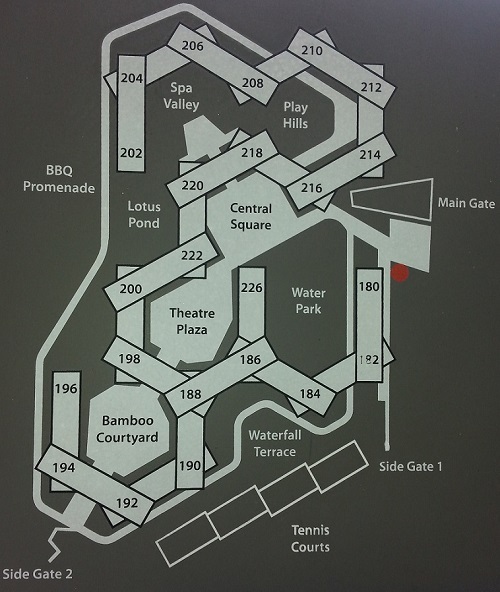 Each themed courtyard gardens have their own unique flavours, but all are designed to cultivate a sense of belonging and bonding. Ole Scheeren - Lead Architect. Ole Scheeren, is the 41 year old bachelor from south western Germany who demonstrates a flair for the unconventional. He is also the designed architect for the stunning ‘The Interlace’ residential project in Depot Road, which revolutionised the way condominiums look in Singapore. From making do without the regular static tower blocks of The Interlace Condominium in Singapore to linking two towers with a 90-degree twist in the Beijing’sCCTV Headquarters, Ole Scheeren has demonstrated his flare of doing the unusual - creating buildings to speak for themselves rather than having them to conform to his personal style. He asks: Can architecture be about collaboration and storytelling instead of the isolation and hierarchy of a typical skyscraper? Indeed for Ole Scheeren, people and buildings matter – the people who live and work inside a building are as much a part of that building as concrete, steel and glass. CapitaLand, one of Asia’s largest real estate corporation is a major developer in Singapore. From condos to landed housing, CapitaLand’s homes are aesthetically designed to cater to a broad spectrum of homebuyers across all market segments. Its portfolio of homes include d’Leedon, The Interlace, The Nassim, The Seafront on Meyer, Urban Resort Condominium, Urban Suites, The Wharf Residence and Latitude. The company partakes of its leadership position through the building of beautiful homes of enduring value, continual innovation and product quality. CapitaLand’s homes have been duly recognized with a number of international and national awards. Award-winning projects testifying to CapitaLand’s commitment to quality and design include The Interlace, The Seafront on Meyer, Urban Suites, Latitude, Citylights, RiverEdge and Varsity Park Condominium. Hotel Properties Limited (HPL) was listed on the local Stock Exchange in 1982. Starting with just the Hilton Hotel in Singapore, HPL has expanded rapidly and has interests in 21 hotels spanning 9 countries today. Hotel Properties Limited has also established its position as a niche property developer of prime residential properties in Singapore. The Interlace - OMA and Ole Scheeren's vertical village in Singapore is named the World Building of the Year 2015 at the World Architecture Festival (WAF). It is celebrated for being "an example of bold, contemporary architectural thinking," with a "radical new approach to contemporary living in a tropical environment," WAF Director Paul Finch said. The Interlace condominium in Depot Road has been lauded by the international architectural fraternity as a "trailblazer", winning the top prize at this year's World Architecture Festival...considered the Oscars of the architectural world. Festival director Paul Finch said the judges were impressed by its "bold, contemporary architecture and thinking". CapitaLand Singapore has created a stir in the market by rolling out its “Designer Series”, showcasing 30 fully furnished units at The Interlace with interior design packages worth $100,000 to $180,000 per unit. Will such an innovative scheme draw buyers who have otherwise been focused on bargains? It is a clear departure from the recent trend of aggressive price discounts and rebates by developers and funds looking to clear unsold units. Units at The Interlace “CDS” fully furnished outfits will certainly differentiate itself from the rest, property consultants say. 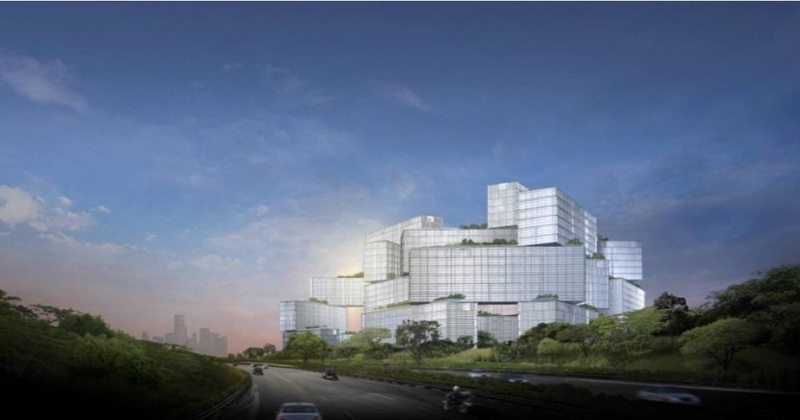 For CapitaLand, The Interlace was never meant to be a run of the mill project. The Big 3 - Star Architects, Iconic Landmarks, Signature Developments.